The Telecom Regulatory Authority of India (TRAI) on 17th April 2018 has launched a common beta version of portal to compare various tariffs and plans offered by Telecom Service Providers (TSPs) like Vodafone, Jio, Airtel etc. 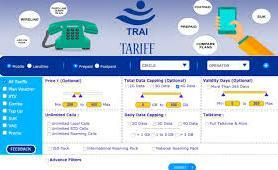 The TRAI new website portal is as (www.tariff.trai.gov.in). It will enable consumers see tariffs of different TSPs and different Licensed Service Areas (LSAs) at single place. The TRAI new website is the first of its kind platform to be backed by the government aims to bring on one platform telecom tariffs offered by different operators and in different service areas. The TRAI new website portal is believed to cater more transparency and information on multiple tariff offerings by telcos and help consumers & stakeholders at ease of access. The TRAI new website portal will not only benefit consumers but also help other stakeholders do a comparative analysis. It also provides various tariff plans and other tariff instruments in a downloadable format. The TRAI’s new portal beta version is now only available only for Delhi LSA circle. It provides regular tariffs, special tariff vouchers, promotional tariffs and value-added service packs among others. The TRAI tariff portal has a segment where consumers and stakeholders can share their feedback by clicking on the 'Feedback' option available in consumer view.